We have rounded up a fabulous collection of Dog Cake Ideas for birthdays and there’s something for everyone. Check them all out now and be sure to Pin your favorites. Everyone loves a cute dog and you may even be a proud dog owner yourself. When it comes to parties, these Dog Cake Ideas for Birthdays offer a huge selection to choose from. These tutorials don’t require any fancy cake pans or equipment. To make most of them, you’ll just need to make basic sheet cakes using the templates provided. This delicious looking husky cake tutorial comes from Betty Crocker. Using two sheet cakes, you’ll just need to print out their template and cut out the shapes, as shown above. To make the cakes you’ll need 2 boxes of cake mix, along with three containers of whipped icing. You’ll also need some food coloring to color the frosting and a few different candies for decorating. Just as the husky cake above, this Golden Doodle cake is made from 2 sheet cakes. You’ll need to print out the templates on the Betty Crocket website in this post, and cut shapes out of the cake. This adorable Schnauzer cake is made using two sheet cakes and printable templates, found in this post on Betty Crocker. They also have full instructions on how to make the adorable decorations! Don’t you just love the idea of a chocolatey Chocolate Lab? This cake from Betty Crocker uses some candies for eyes and paws, as well as a cute little fruit roll-up scarf. Here is another great sheet cake tutorial from Betty Crocker! You can grab the templates and instructions for this one above. Little sprinklings of chocolate shavings or sprinkles give this Springer Spaniel his dusting of spots! Does it get any cuter? If you have a German Shepherd this cutie is for you. It’s another great idea from Betty Crocker. We love the technique for making the curly fur on this poodle cake and as you can see it’s very simple to make. If you love tiny Chihuahuas then you’ll love this dog cake idea! 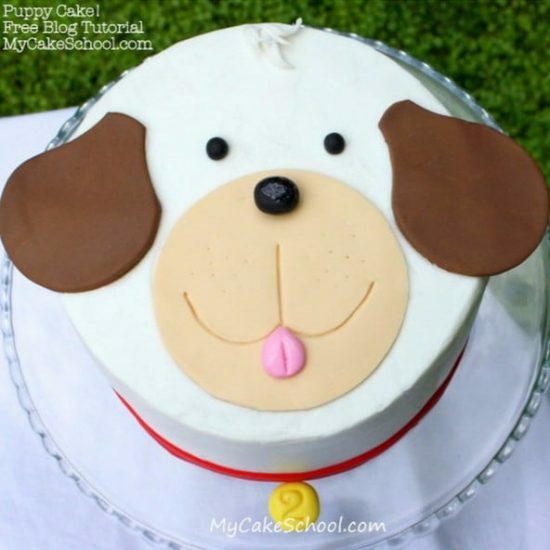 Get the full step-by-step tutorial and printable dog cake templates. Here is a great idea by Rachel’s Cakes. 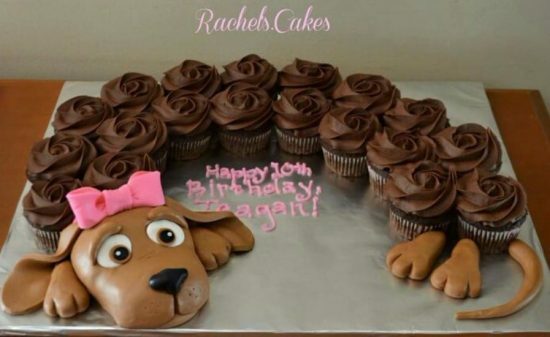 Making a dog’s head and paws (or using decorations), add some cupcakes into the middle to make a cute mini dachshund. There is no tutorial for this one, but it’s great inspiration for a cute looking cake! We couldn’t believe our eyes when we came across this Dog Cake on Instagram and it’s easy to see why she has been so popular. Here’s another version of the Dog Cake from Ivanoven on Instagram with different colors. The creator is seriously talented! 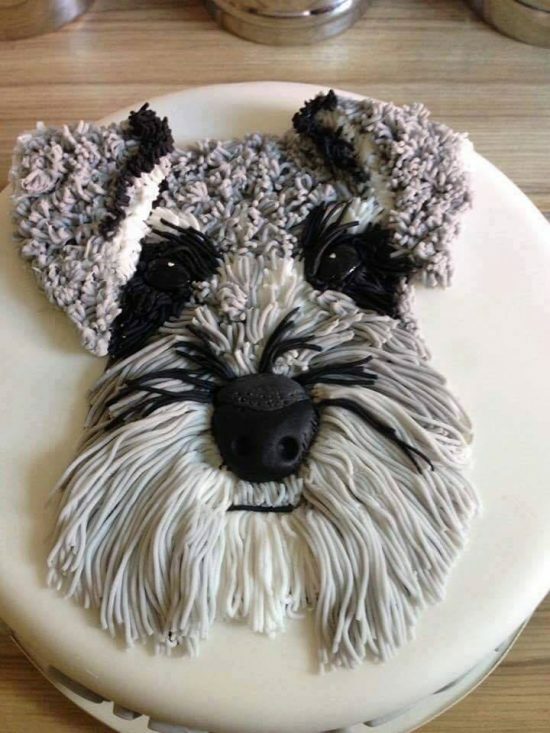 This amazing Schnauzer Cake from The Little Cupcake Bakery is another show stopper. Don’t you love the incredible detail? Some people sure are clever! This cake, made by Roundhouse Cakes is great inspiration. 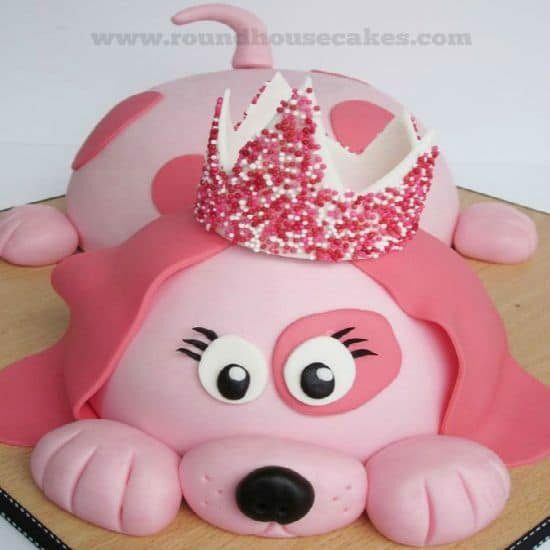 Who wouldn’t love a pink puppy princess cake with a sprinkle crown! You could make something similar using two round cakes for the head and body, and either cupcakes or fondant for the paws and nose. The rest of the pieces are made with fondant.